I should point out at this juncture that I’m not against religion or religious people. Religion has done some good things and it has done some bad things. If we were to express their good versus bad as a baseball batting average, then I’d have to learn something about baseball. Anyway, this got me thinking, which has been known to happen occasionally. Religious people are often very keen to sell their religion door-to-door. They often have pamphlets, invites to their church (or whatever), or even their indoctrination material for sale. I am yet to have a scientist knock on my door of a Sunday morning, “Have you heard the word of Newton?” At least with scientists door knocking they could fix the zero-point anomaly in our laundry; it’s starting to cause a gravity sink. See, this would be brilliant marketing for any author. Imagine an entire squad of people devoted to spreading the word about your book/s. Unpaid labourers whose goal it was to sell your writing to everyone. Of course this wouldn’t be easy to arrange. I’m not sure I can afford the price of souls these days – what with the economy and all – so getting boots on the ground might either take a lot of enigmatic persuasion or be the realm of wealthy authors. There are plenty of examples of this happening. If you do a little digging you can find how L Ron Hubbard got his book Battlefield Earth on the bestseller lists. Every Scientologist was sent out to buy a copy, which they then sent back to the “church” (I use that term loosely) and the books were sent to the stores again to be resold. Brilliant! Obviously not every author can create their own religion to sell books, but maybe there is something to be made use of here. Maybe your local Jehovah’s Witness may need some extra redemption and would like to sell your book door-to-door if you promise to not set the bear traps on the doorstep. Think about it! Oh! Oh! I soooo want to go spread the word of Newton now! You could run door-to-door!I already spread the word of Newton. Every time some idiot talks I slug them in the jaw. Newton's third law in action. 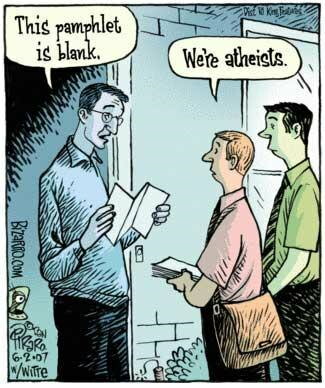 I've had Jehovah's witnesses knock on my door too. The opening question is always the same: "Have you found Jesus?" In my mind the answers also are always the same: either, "I didn't know I was supposed to be looking for him" or "No, has he gone missing again?" My mouth typically offers a more polite response, however: "Not yet, but why don't you leave me some literature." Yes. To lose a deity once is unfortunate, to lose him twice is just plain careless. Previous Previous post: NaNoWriMo 2011 – Day 10: Writing is overrated!